An old silver airplane sits in one of the outbuildings of the Smithsonian Institution’s Silver Hill museum and storage complex. Aside from an odd catwalk built onto the aircraft, to allow access to the engine while in flight, this plane looks much like many others flown in the 1930’s. But 44 years ago some 10,000 spectators came out to meet Ole Miss, as her wheels touched down on a Mississippi airport. The story of Ole Miss begins at a small airport in Meridian, Miss., in the early 30’s at the beginning of the depression. Two brothers, Fred and Algene Key, natives of Meridian, had been appointed managers of the new Meridian Municipal Airport. During the depression, in Mississippi as in the rest of the country, many people weren’t sure where the next month’s rent was coming from. Business at the airport was scarce. There were few commercial contracts and little student flying. There was ample time for dreaming, however, while waiting for the occasional customer. Al and Fred decided that the airport, Meridian and aviation in general needed some publicity. Why not attempt an endurance flight? Several records had been set recently. Two brothers, John and Kenneth Hunter, had set an official endurance record of 24 days aloft without landing, in 1930. The Keys decided to make an attempt at a new world record. Sponsors and a plane had to be found. W.H. Ward, a friend of the brothers, donated a Curtiss Robin J-1 Deluxe, a small 165-hp airplane. It was named Ole Miss. The Meridian Chamber of Commerce and the Meridian American Legion furnished some financial support. Modifications were made to Ole Miss to prepare her for the long flight. A wireless telegraph and an extra 150-gal. fuel tank were installed. 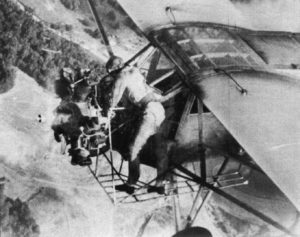 A hatch was cut into the top of the cabin to allow food and supplies to be lowered from a supply plane. 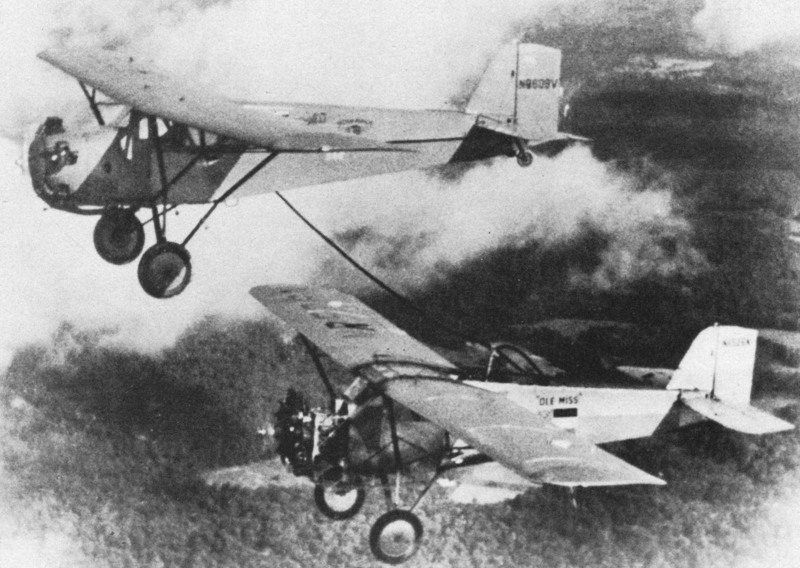 The Key brothers of Meridian, Miss., proved definitely in 1935 that in-flight refueling was possible. During their 27-day flight, Al and Fred Key made 107 fuel transfers, consumed 6,000 gallons of gas, 600 gallons of oil and broke all endurance records. The most interesting addition was a catwalk surrounding the engine, to allow mid-air maintenance and possible emergency repair! Also, short exhaust stacks were installed to allow monitoring of the exhaust flames, a means of judging proper fuel mixture. It would be necessary to transfer fuel to Ole Miss several times a day during the flight. A.D. Hunter, a Meridian mechanic, designed an automatic cutoff valve to permit easier re­fueling from one airplane to another. Variations of Hunter’s valve are still in use today for in-flight refueling. A fuel-carrying plane, flown by a friend, James Keeton, whom Al had taught to fly, would position itself above Ole Miss and lower a fuel line. Whichever brother was not at the controls would reach up, position the hose, and use a wire attached to the hose to ground the two airplanes together to prevent sparks. It was possible to load 60 gallons of gas from the refueling plane to the Ole Miss in six minutes. With all necessary equipment aboard, the Curtiss Robin would carry a load of 1,681 pounds, fully 756 pounds over its usual load capacity. On June 21, 1934, Al, Fred, and Ole Miss were ready. As 10,000 on­lookers watched, Genevieve Lynn, one of Mississippi’s first women pilots, christened Ole Miss. A sealed barograph, which would indicate the altitude of the flight and which could also reveal unofficial landings, was in­ stalled in the tail section by representatives of the National Aeronautical Association. At 6:35, Ole Miss rolled down the runway and took off. The flight only lasted 123 hours. One of the engine’s cylinders loosened and could not be repaired in flight even with the aid of the catwalk. The morning after the landing Al and Fred went to work. The engine was replaced and a modern voice radio was substituted for the wireless telegraph. A smaller gathering of 1,500 watched Ole Miss make its second attempt on July 21. Then, four days into the flight, massive storms formed around the small plane. First Al, then Fred, tried maneuvering around the bad weather but to no avail. The storms followed them even though Ole Miss was flown in ever-widening circles. Al headed for Louisiana. The weather front was there, too. He tried climbing; at 11,000 feet the conditions were the same. Everywhere there was flashing lightning, heavy winds and rain. It would be almost a year before Ole Miss would fly again. More money had to be raised. Then, too, the weather they had encountered on the second attempt had convinced the brothers that they needed more cockpit instrumentation. Simple instruments, which almost every airplane has today, were installed: a radio direction indicator, turn-and-bank indicator, artificial horizon and a gyro compass. Going wing-walkers one better, Fred Key performs in-flight powerplant maintenance. Due to the failures of the first two attempts only a scant 100 diehard supporters were present when, at 12:32 p.m., June 4, 1935, Ole Miss left the earth for a third attempt at the record. The flight soon settled into a routine. Four times a day the refueling plane would make contact with Ole Miss. The refuelings went smoothly with one exception when the fuel hose hit Fred in the face. Food and oil were passed down through the hatch in the cabin roof in weighted sacks. Meals for the brothers were prepared by the Keys’ wives at the Meridian airport. Ole Miss flew in wide arcs from Mississippi to Alabama, always returning to the area near Meridian. Ten days passed before Ole Miss began to receive recognition from the national press. Occasionally Fred, being smaller, would clamber onto the catwalk and oil the valve arms or make minor adjustments to the engine. Once he very nearly fell off when he failed to fasten his safety line. Occasionally, rough weather would assault Ole Miss and the pilots then would average only three hours of sleep a day. On June 24, Al developed a painful abscessed tooth. The Keys’ father, on the ground, contacted a dentist who gave instructions by radio on lancing the swelling. Al performed the operation himself. Three days later it was discovered that one of the plane’s tires had gone flat. It couldn’t be reached to be repaired. On the same day, June 27, the previous official world record of 553 hours, 41 minutes and 30 seconds, set by the Hunter brothers earlier, was broken at 3: 13 in the afternoon. On the ground crowds cheered as the Meridian City Council changed the name of the airport to Key Field. A band played “Praise God From Whom All Blessings Flow.” The plane circled the crowd and the brothers waved. Al and Fred now decided to attempt to surpass an unofficial world record set by Forrest O’Brien and Dale Jackson. It was a flight of 647 hours, 28 minutes, and 30 seconds which had been disqualified by a faulty barograph. A storm, which developed on the 29th of June, threatened this attempt. Refueling was accomplished at almost the last minute. Another complication was that this time the brothers couldn’t fly around the storm because, if forced down at an airfield other than the one their flight originated from, their record would be invalid. Luckily the storm turned out to be less serious than it had first appeared. The brothers’ adventures continued, however, when on Saturday, June 30th, after a refueling contact, the plane’s battery caught fire. Al shut off the engine and the fire was extinguished. By the time the engine was restarted Ole Miss had descended to within 200 feet of the ground. It was a long, grueling flight. The left stabilizer brace had been weakening for some time. To stay aloft longer would be unnecessarily hazardous. So, on July 1, with all the world ‘s endurance records broken, the brothers decided to end the flight. Al brought Ole Miss, complete with flat tire, back down to earth. After 27 days, 5 hours, 33 minutes and 30 seconds Ole Miss was still. Over 10,000 cheering admirers surrounded the plane and the brothers. Bleary-eyed and exhausted, Al and Fred were reunited with their wives and children. The two fliers were then taken to a hotel where they enjoyed their first sound sleep in 27 days. Ole Miss in those 27 days aloft had traveled 52,320 miles, enough distance to circle the earth twice. She consumed 6,000 gallons of gas and 600 gallons of oil. There had been 438 in-flight contacts and 107 fuel transfers. The engine had turned over 61 million revolutions! The practicability of in-flight refueling had definitely been proven. Al and Fred were the heroes of the nation. Both received honorary commissions as colonels in the Mississippi National Guard and made numerous appearances throughout the country after their flight. A plan to circumnavigate the world was discussed, but World War II brought an end to that adventure. Al and Fred went to war, both flying B-17s. Their planes’ names? Ole Miss II and Ole Miss Ill naturally! Al and Fred’s record remained unbroken for over 20 years.